This interview was conducted on January 2, 2007 by Ms. Carel Thomas, the marketing manager of CP Lab Safety, founded by Dr. Ramin (Ron) Najafi in 1996. 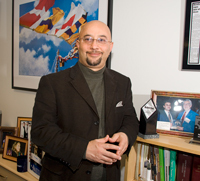 Question: Dr. Najafi, what was your motivation behind inventing the Safety Ecological Funnel? Answer: In the mid-1990's I was working as a PhD Synthetic Organic Chemist at a major biotech company in the San Francisco Bay Area. Thanks to our management at the company, safety in the work place was considered of primary importance. I got the opportunity to solve a real problem at the company, and then continued to offer the solution to others. This is how it all happened: Typically, my colleagues and I would leave our waste bottles open under the fume hood and, within days, most of the solvent would evaporate and be sucked out the hood into the surrounding atmosphere. The ugly consequence of this unintentional action was the contamination of the air, neighborhoods and, of course, the rest of our buildings. From time to time, we used Mercaptans (CH3SH), which resulted in unbearable odors, and got complaints from the office workers and safety managers in our facility. They could smell the air contamination, even at a long distance from the laboratories. Q: How did chemicals from the laboratory fume hood travel all the way to the office area? A: That is a good question. If we used an odorous compound in the lab, everyone could smell it in the office area. We discovered that the exhaust of the fume hood and the air intake of the office area were close together in the buildings, which proved the connectivity of the office area to the laboratory through air exhaust and air intake on the roof. So, when we decided to design a safety funnel back in 1994, our goal was to minimize the evaporation of solvent from the waste bottles to address this health and safety problem. A: Although safety was important to our upper management, we had to show them where the problem originated before they could initiate changes. As a concerned member of our company Health and Safety Committee, I worked with our Safety Department to analyze precisely what was being emitted from the waste bottles over time. In a simple experiment, we marked the solvent levels in the bottles before going on holiday. During the 10 day period that the entire site was closed, such an obvious volume of liquid had evaporated that it was easy to prove that the air contamination in the laboratory was coming from the open waste containers. Once we presented the result to our upper management, there was no doubt in my mind that they desired a solution to the problem. I am an inventive person, so I looked for a way to mitigate this and spent many nights and weekends in my garage working on a solution. The key was to create a device that would allow a chemist to dispose of solvent just as easily as the current open funnel system, but would not permit evaporation from the bottle. Most importantly, the device would need to be easy to use so the workers would actually utilize it. I figured that, if I could create this device, there would be peaceful cooperation between the chemist who wanted the simplest product, and the health and safety officers who wanted to contain the fumes. During the last several years, CP Lab Safety's Ecological Funnels have become mandatory in many Pharmaceutical and Chemical companies. Because it is designed to prevent evaporation of solvent from the waste bottle, the ECO Funnel™ reduces exposure of workers to flammable and potentially toxic substances. Additionally, it eliminates a key component of "fire triangle," minimizing the chances of fire in the workplace. Safety officers and fire marshals have found CP Lab Safety's Ecological Funnels are a key component in a proper fire safety program in the laboratory.